Open to the USA and Canada only. By entering this giveaway you are signing up to receive our newsletters. Winner has 7 days to claim their prize after being notified. Winner will be contacted by email within 48 hours of the giveaway ending. 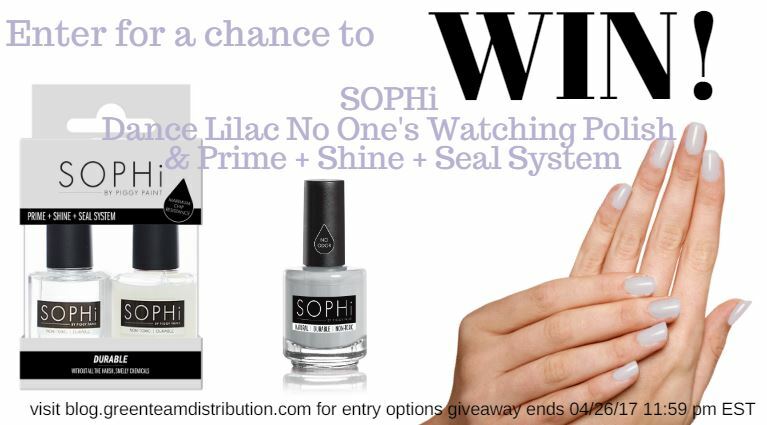 This entry was posted in Blog and tagged #entertowin, green team giveaway, sophi nail polish. Bookmark the permalink. Would love to try the Morning Kisses Piggy Paint! Looks so refreshing! i love the POP-arazzi colour! I am loving Lost in London! I want all of the colors, but mi amore and boyfriend abroad are at the top of my list. I like Forever Fancy! Sometimes Sweet is a really nice red. I’d pick the Piggy Paint it looks so nice. I like the Wild Child Piggie Paint.It’s really cute. Lost in London is on the top of my list! I’d like to try Piggy paint. I would like to try the Honestly phresh deodorant.